Can Cameron satisfy voters on Europe? November 03, 2014, 9:08 a.m. The European Union’s new Commission starts work this week with relations with Britain more fraught than for some months. 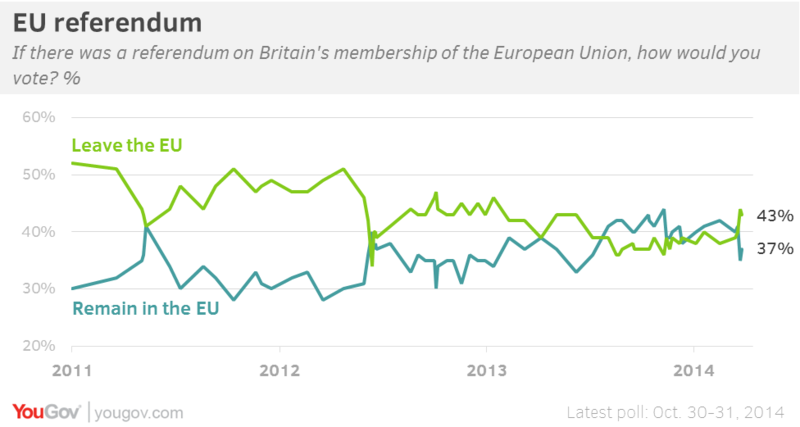 For much of this year, YouGov has found a narrow but persistent preference for the UK remaining in the EU. However, two surveys in the past week find that the public has turned against Brussels again. Our latest poll for the Sunday Times shows that if a referendum were held now, 43% would vote to leave and just 37% to stay in. Three particular issues have been causing concern at Westminster. Let us take these in turn. 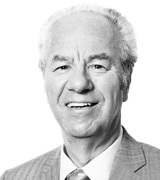 A few months ago, Britain exercised its right to opt out of a set of EU justice arrangements. Ministers said that they would then decide which particular EU rules they would opt back into. One of these is the arrest warrant. This is in effect a standard system for extraditing people facing criminal charges that carry a significant prison sentence. David Cameron and Theresa May, his Home Secretary, say the police and security services need Britain to sign up again the arrest warrant; without it, too many people who commit crimes in Britain are likely to evade justice. Their opponents – including Ukip and many backbench Conservative MPs – say that law-abiding Britons might be forced to stand trial elsewhere in the EU for crimes they did not commit, or for actions that are not serious offences here. Voters are firmly on the Government’s side. 56% say we should opt back in, while 18% disagree. Among Tory, Labour and Liberal Democrat voters, more than 60% favour opting back in. For once there is a large majority a clearly ‘pro-European’ stance. True, Ukip supporters are less enthusiastic, but even here, more people support opting back in (42%) than oppose it (34%). Another immediate issue facing Cameron is how to respond to the European Union’s demand for a one-off payment of £1.7 billion, following a recalculation of each country’s contribution. Britain is caught because our economy has done better than other EU states in recent years, and also because of a change in the way government statisticians calculate national income. 52% want Cameron to refuse to pay, while just 35% want him either to pay up willingly (11%) or play by the rules if forced to do so (24%). However, Cameron will be judged in the end by what he does, rather than what he says. At the moment, voters are sceptical. 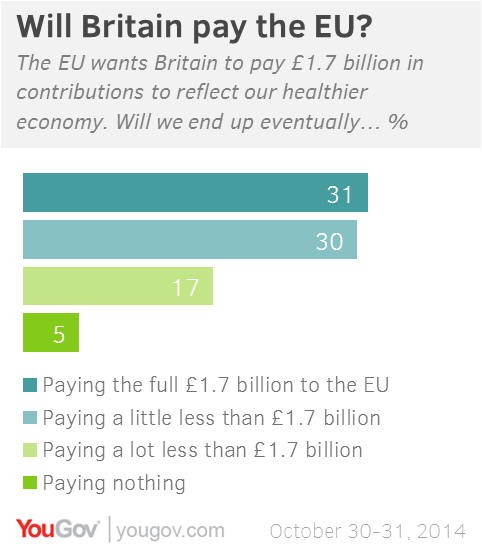 61% think we will end up either paying the full amount (31%) or “a little less than £1.7bn” (30%). Only 22% expect us to pay “a lot less” (17%) or nothing (5%). Worse for the government, two-thirds of all voters agree that past British governments are at least partly to blame for the situation, and that it’s not all the Commission’s fault. 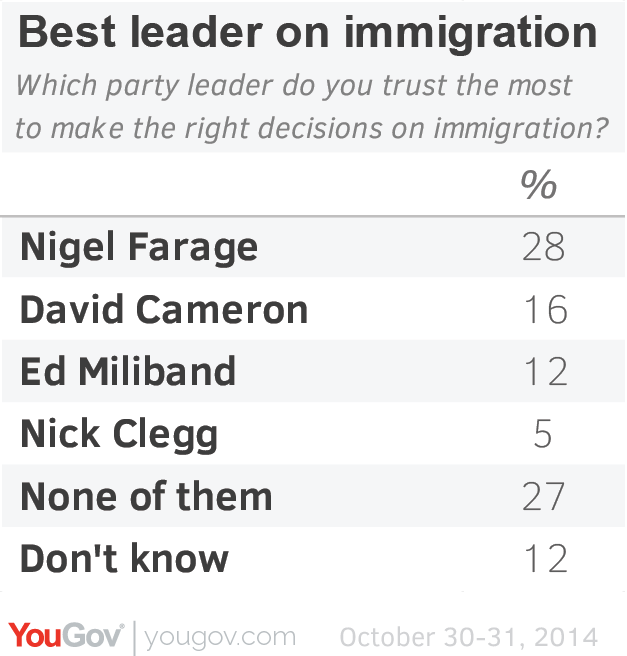 Moreover, 59% blame either the Treasury (29%) or Cameron himself (30%) for being caught by surprise. Only 18% reject the Commission’s statement that they made the position clear some months ago. If Cameron does succeed in reducing the £1.7 billion bill significantly, he is likely to get a boost in his ratings, because he will have been seen to have defied the public’s low expectations and repaired at least some of the damage done by ministers’ failure to see the problem coming. Number of immigrants coming to UK each year. Only 15% have the figure in the right range (200-300,000), with 40% overstating the true figure. The number of immigrants from the EU claiming Job Seekers’ Allowance. The true figure is around 60,000, or 3%; the median answer is 300,000, or five times the true figure. Among Ukip supporters, the median is 500,000. In other words, many people hold views that are rooted either in an exaggerated view of what is happening today – or, perhaps, a refusal to believe the Government’s statistics. Bearing that in mind, we find that 50% think Michael Fallon, the Defence Secretary was right to say that some communities are being ‘swamped’ by immigrants (He subsequently withdrew the word.) A further 28% saying what he said was true but the word was unwise. Just 13% think what he said was untrue. As for the issue of free movement, one person in three opposes action to reduce the number of immigrants settling in Britain from the EU: 23% want to keep free movement in principle, while 10% want a limit set at 200,000 a year or more – that is, more than come today. 43% want a cut that would bite – 50,000 or less. Cameron wants to renegotiate EU rules so that Britain is able to curb immigration from other EU countries. We have yet to see whether he intends to do this through direct measures (clear numerical limits) or indirectly (for example, by altering the rules on welfare benefits, including tax credits and child benefit). However, our survey suggests that if Cameron can’t obtain significant changes, he may have difficulty persuading Britain to vote in a referendum to stay in the EU. If Cameron can’t get the EU to agree to changes in the freedom of movement rules, the margin for leaving the EU grows to 49-33%.